Tucked in the northeastern corner of the Mediterranean Sea, south of Turkey, is the island of Cyprus, and in Cyprus is a town called Lefkara, which gives its name to a regional “lace” called Lefkara Lace. 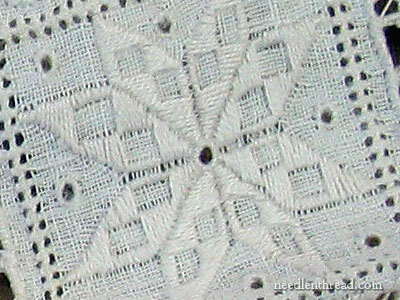 Lefkara Lace is a combination of drawn thread, whitework, and needlelace techniques. I was fortunate to receive some beautiful pictures of Lefkara lace from a reader in Lebanon who hopped over to Cyprus for a short while, so I thought I’d share some of the photos with you! 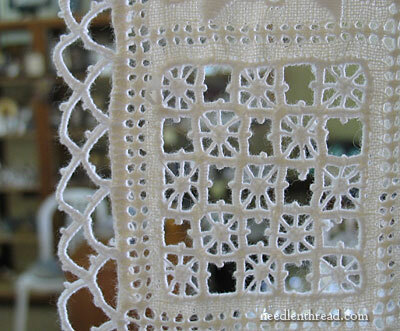 This is a beautifully worked open motif on a piece of Lefkara lace, and the shot also shows off the lacy edges. Alternating with open spaces, it is usual to find areas that are stitched with geometric designs like this one. And here you can see the whole cloth, with alternating squares of openwork and filled embroidery squares. I’ll be writing a little more about Lefkara lace and sharing some more photos with you soon. In the meantime, I thought you’d enjoy the preview! I hope you have a great weekend! Look for me on Monday! what a stunning piece of needlework. thank you so much for sharing the pictures and i am looking forward to hearing more. i can’t sit down and do nothing. if i am sitting and not otherwise preoccupied there is a needle and thread in my hand. i even keep assorted easy projects bagged and by the door for picking up for a just the drive to somewhere, or an appointment, or even dinner out (though that is quite rare) so i have something to do while i am waiting for our food to be served. you would think.that our house would be embroidered by now but i have arthritis in my hands and work very slow. that doesn’t bother me a whit. my mother started me embroidering at the age of four. a little stamped cross stitch kitty head. all i want is the joy to be able to do it. but to be able to produce a masterpiece like that lefkara lace. welllll i can dream. have a wonderful evening. Exquisite. I am looking forward to your detailed post. Hi; Have a book with instructions—have done the very basic stitches and have a piece almost completed. I like the doing and the look of the lace but I am still partial to the Italian and also the French have a good book out. REna. 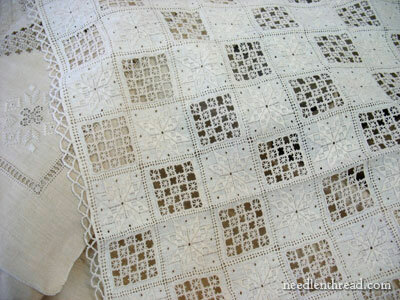 Beautiful, Mary, It looks a lot like a very light weight Hardanger. Is it? Interesting in such distant places as Norway and Cypress that there would be similar needlework. I’m looking forward to seeing more about this! It reminds me a lot of hardanger.